☕️ Good Thursday morning, and welcome to a day that your children's children will talk about. 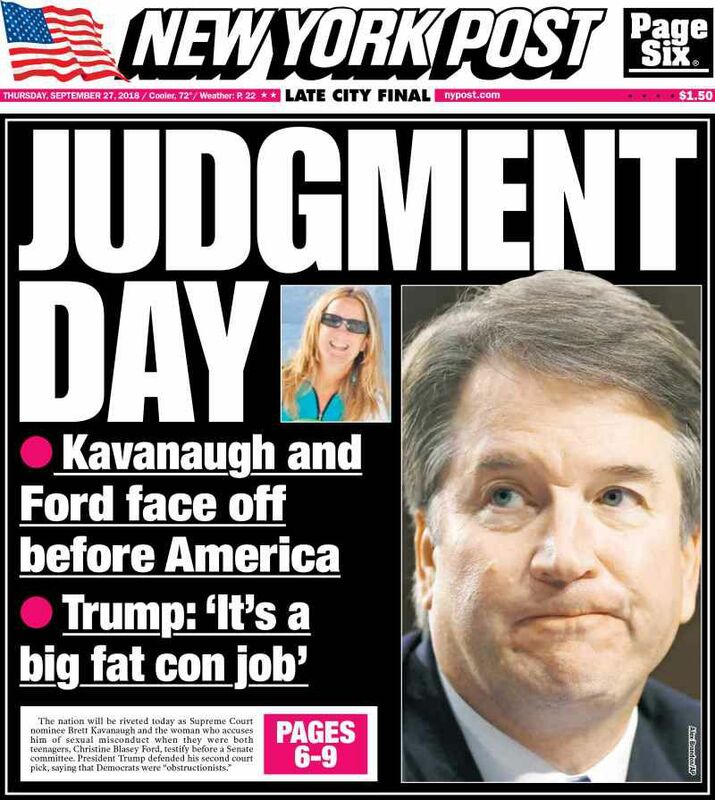 AP calls the Kavanaugh-Ford hearing a "Where were you?" moment, like when President Reagan was shot or the space shuttle Challenger exploded, or on 9/11. If you're in D.C. tomorrow, at 8 a.m. Axios will host a rare back-to-back appearance by two of the world's most powerful regulators: European Union competition commissioner Margrethe Vestager, and Assistant Attorney General Makan Delrahim, who leads the Justice Department's Antitrust Division. RSVP here. 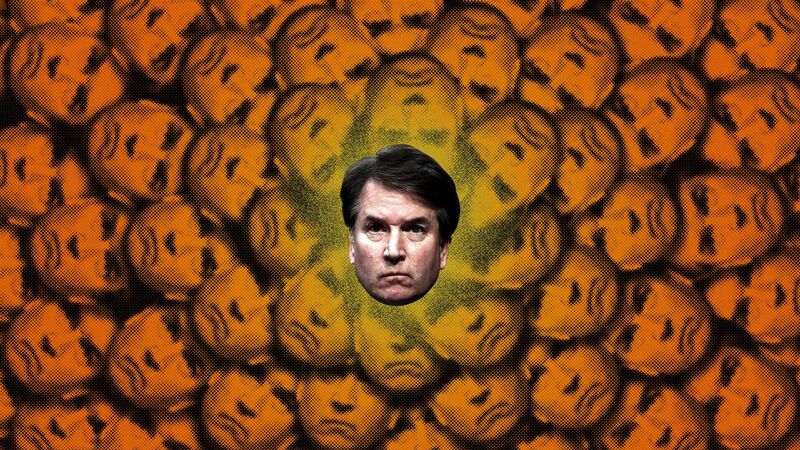 1 big thing: Kavanaugh "hopping mad"
Team Kavanaugh sources last night ranged from nervous and unsure to modestly confident. All agreed that Kavanaugh's Supreme Court confirmation hinges on how compelling he and Christine Blasey Ford are at the 10 a.m. Senate Judiciary Committee hearing. 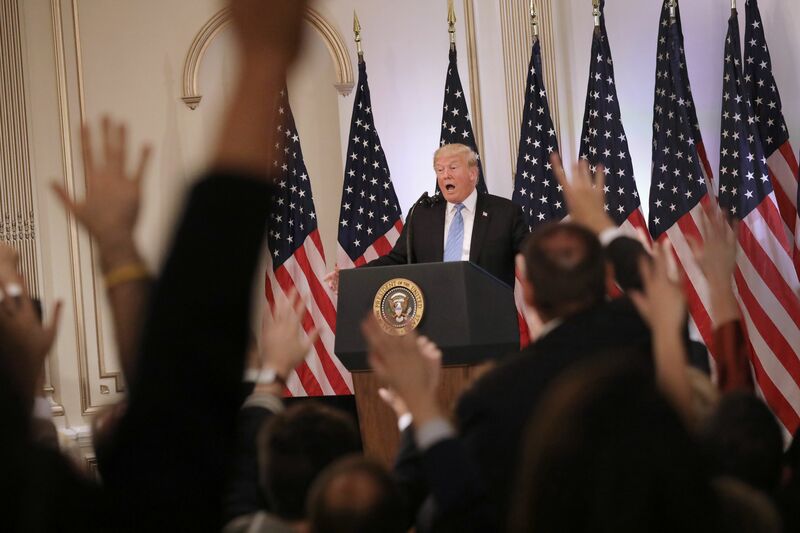 "With the wall-to-wall coverage starting at 10 a.m. EDT [including on the broadcast networks], the hearing promises to be a national drama along the lines of Clarence Thomas’ confirmation hearing in 1991, when Anita Hill testified that he had sexually harassed her." 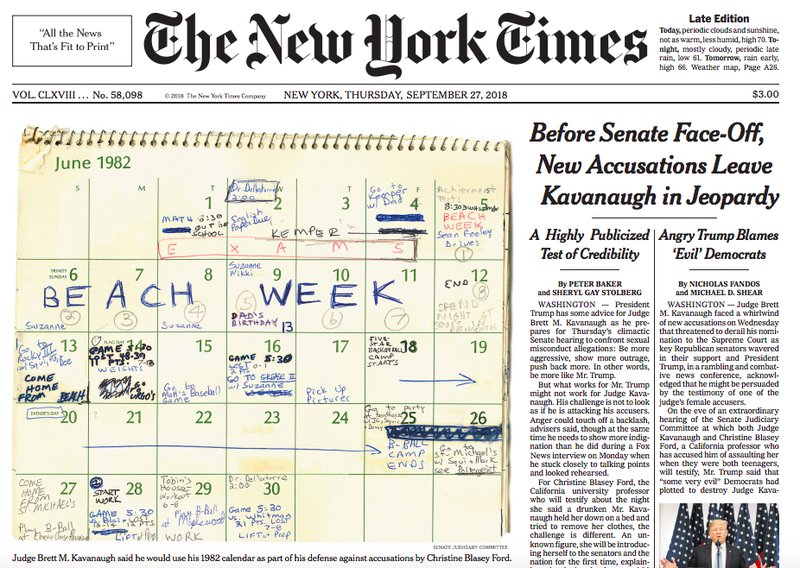 "Holding a printout of [Julie] Swetnick’s declaration [released yesterday by her lawyer Michael Avenatti], she asked why the Judiciary Committee was not issuing a subpoena for [Mark] Judge, who has appeared in two separate accusations." 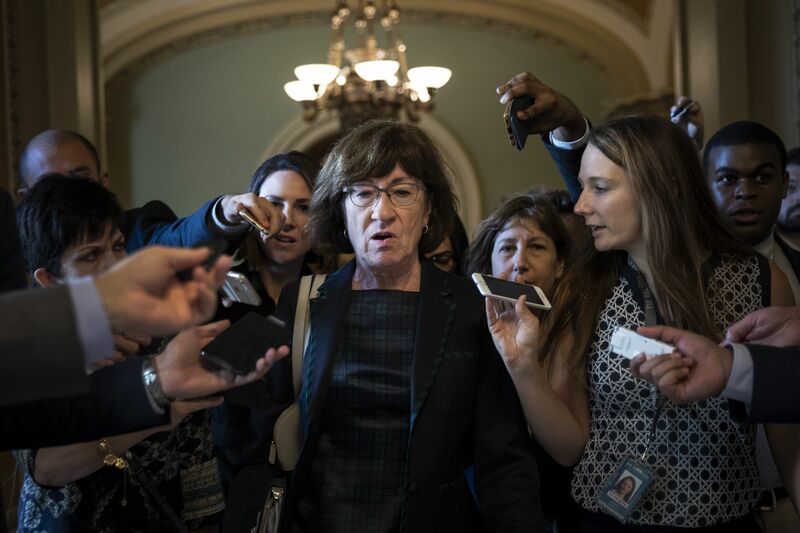 "Collins joined two other Republican senators, Jeff Flake of Arizona and Lisa Murkowski of Alaska, in expressing reservations about the Kavanaugh nomination, more than enough to sink it." Brian Fallon of the progressive group Demand Justice told me: "The looming hearing has given senators something to 'punt' to in the face of all the allegations in the last few days. After the hearing, there won't be any more cover." "Collins, Murkowski, Flake et al. will be exposed and have to choose a side. I will still be surprised if they can wrangle the votes at this point. It is just so fraught with political peril." Michael Bloomberg's spending on House races in the midterms has passed the $80 million he promised for the cycle and is heading toward $100 million as he sees an increasing chance for Democrats to win control, Axios has learned. Half of that will go to women candidates, a Bloomberg adviser told me. As this fall's blue wave strengthens, the adviser said: "We want to take a Category 3 storm and turn it into a Cat 5." 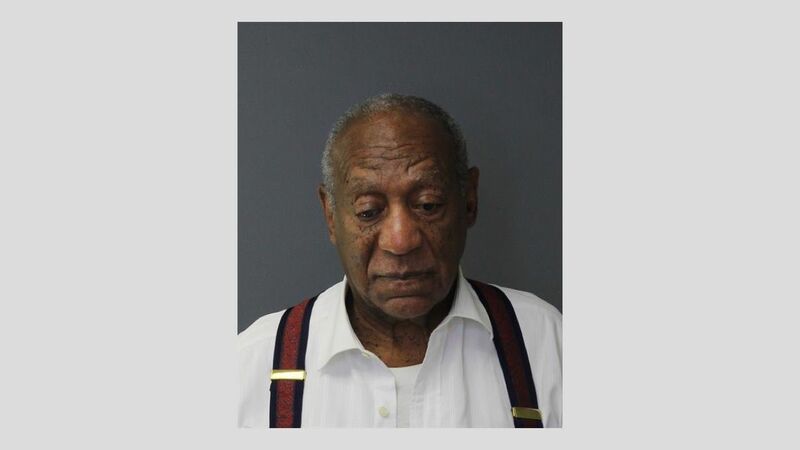 Plot note: The former New York mayor is eyeing a 2020 presidential run as a Democrat. 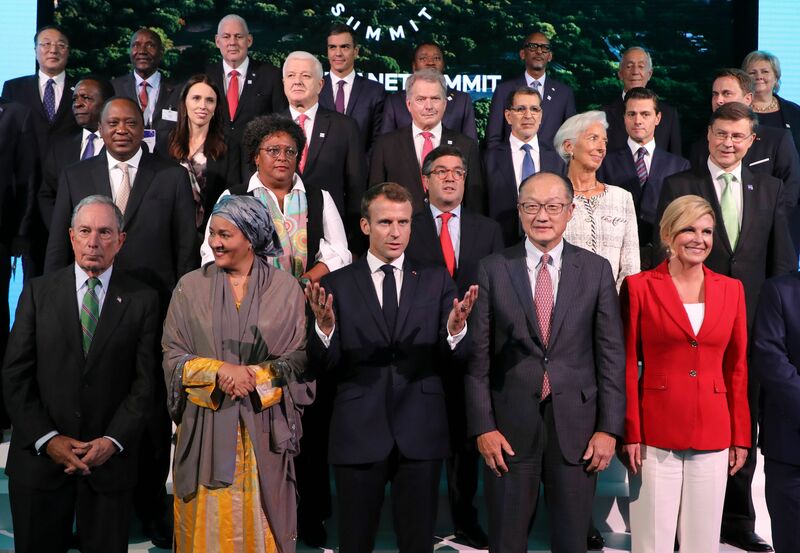 Bloomberg showed his power on the world stage yesterday with his second annual Bloomberg Global Business Forum (and a companion One Planet Summit), which drew an astonishing roster that included 70 heads of state, in town for the UN General Assembly, and 200 CEOs. Spotted: Bill Gates, Bill Clinton, Henry Kissinger, French President Emmanuel Macron, U.K. Prime Minister Theresa May, IMF managing director Christine Lagarde, Uber CEO Dara Khosrowshahi, private equity titans Stephen Schwarzman and Larry Fink, Jeb Bush, Cindy McCain, Steve Case, Steve Rattner, Andrew Ross Sorkin and more. On Trump's UN speech: "I would rather laugh with than laugh at. I think our president, for reasons I don't understand, says things that just elicit that kind of response. It has nothing to do with his policies. I disagree with most of them and that's a separate issue." "You've got to remember, he is a real estate guy, a promoter. ... And so he comes from a world where you exaggerate; there's a lot of hyperbole." "You'd think by now somebody would have taught him, 'You don't say those things.'" On his heavy midterm spending for women: "We should have a better balance — I've always been in favor of that in business and everything else." In this photo, Clarke Gayford sits with daughter Neve as his partner, New Zealand Prime Minister Jacinda Ardern, speaks at yesterday's Bloomberg Global Business Forum in New York. 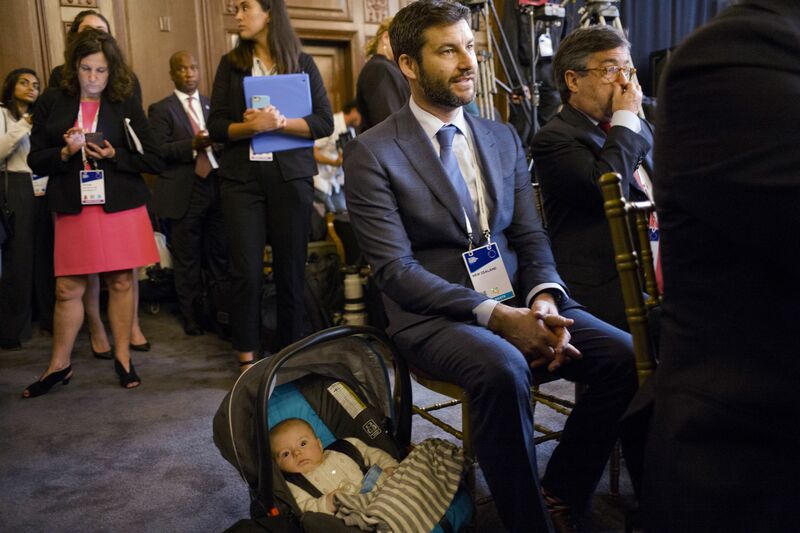 The baby, born in June, became a star of the UN General Assembly when the prime minister brought her to the annual gathering of world leaders, with the two being spotted together inside the assembly hall. "I'm combining my role as a mum and also as a leader and it is entirely possible to do both," Arden said. "She comes to functions with me. So, politicians love holding babies." Now you know: "Ardern is just the second elected world leader in modern times to give birth while in office. The last female politician to give birth while heading a government was the late Pakistani Prime Minister Benazir Bhutto," in 1990. "Call it a sea change, a groundswell or a seismic shift, but whatever this new and powerful phenomenon is, it’s more than just a #MeToo moment." 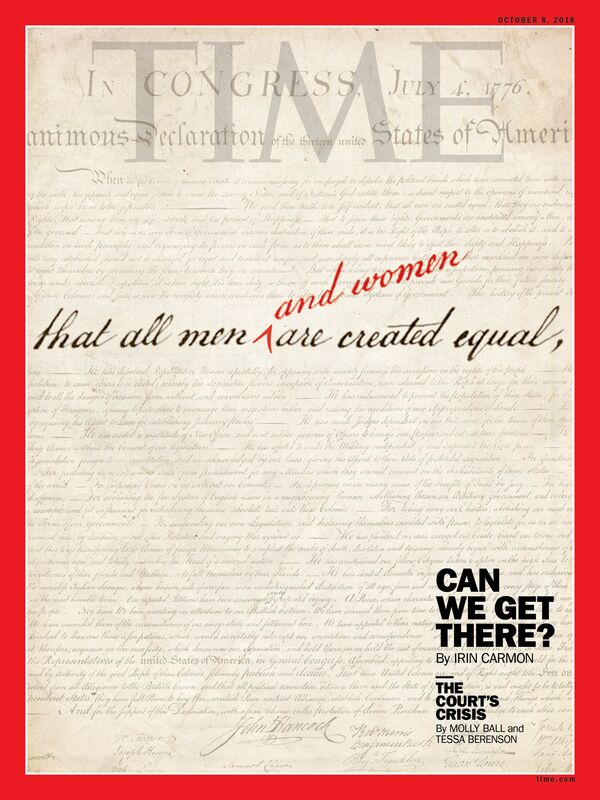 "It’s the upending of a pervasive culture where the victimization or degradation of women was simply considered collateral damage on a mogul’s or CEO’s path to glory … or a judge’s path to the Supreme Court." "The hashtag revolution, which gained steam a year ago under rallying cries that included #MeToo, #MyHarveyWeinstein and #WhatWereYouWearing, had evolved into an actionable, tangible move toward justice." Tomorrow, Google CEO Sundar Pichai will meet with House Majority Leader Kevin McCarthy "and more than two dozen Republicans to discuss complaints the company is trying to silence conservative voices." McCarthy said in a statement: "Google has a lot of questions to answer about reports of bias in its search results, violations of user privacy, anticompetitive behavior, and business dealings with repressive regimes like China." Why it matters: "The Friday meeting will cap a week of tech-related sessions in Washington in which Google — in the cross hairs of Silicon Valley’s conservative critics since late summer — has played a starring role." "Despite the country’s commitment to equality, most Swedish women I talk to are ready to tell me about what falls short." "And yet. The fact that Sweden hasn’t entirely eradicated sexism doesn’t mean there’s no point in ­trying — it just means that this is a generations-long shift that requires trial and error, and a commitment to gender equality from every man and woman in the country." "Above all, the shift will require Americans’ learning to love something many have long hated: Big Government." Why it matters: "The brutal reckonings of our time have made clear that the current way isn’t working." "I always like to finish with a good one. Elton John said when you hit that last tune and it’s good, don’t go back. ... I’ve seen — have you ever seen? They do great. They’re great. They hit the last tune and everyone goes crazy." "Then they go back for an encore, right? And they don’t hit it. And they leave, everyone leaves. And they say that wasn’t a very good concert was it? Let’s go." "Although creator Diane English flirted with a brief revival when Sarah Palin ran for vice president in 2012, 'we wouldn’t have brought back the show if Hillary [Clinton] had won,' says Candice Bergen, who stars as strong-willed Murphy." "All of us felt that now, we had a lot of things to say, and Murphy can address those things in a way that most shows couldn’t."